Laura Russo is pleased to present an exhibition of paintings by Portland artist, Sherrie Wolf. This comprehensive exhibition will include a range of large and small oil paintings depicting powerful still life compositions. 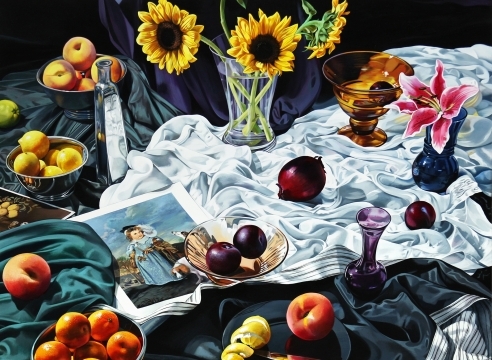 Her love for creating illusion is apparent in these sumptuous renditions of fruit and flora. “My images openly play with the fact that art is artifice.” She places the still lives in front of appropriated imagery excerpted from old master paintings.These combination paintings, many featuring water scenes as a backdrop, create a figure/ground relationship. “The landscape that I place in the background is a flat surface but simultaneously a space in which the still life objects reside. The objects are ordinary, but simultaneously monumental by virtue of the relationship to the majestic landscape in the background.” The result, combining the intimacy of the still life with the worldliness of old master grandeur produces an enigmatic resonance. Both a consummate painter and printmaker, Sherrie Wolf graduated from the Museum Art School, now the Pacific Northwest College of Art in 1974 and received an MA from the Chelsea College of Art in London, England in 1975. A well-collected artist, she began exhibiting her work in the mid 1970s, a time when she also taught art at PNCA and Lewis and Clark College. Her work has been included in exhibitions nationally and internationally. Awards include a grant from the Regional Arts & Culture Council in 2002 and Oregon State University in 2001. Her work is included in such collections as The Vivian and Gordon Gilkey Center for Graphic Arts, Portland Art Museum; Hallie Ford Museum, Salem, OR; City of Seattle; Washington State Art Collection; and Southern Oregon State College, Ashland.